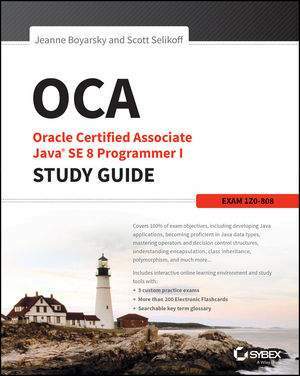 Sybex wrote: OCA: Oracle Certified Associate Java SE 8 Programmer I Study Guide, Exam 1Z1-808 is a comprehensive study guide for those taking the Oracle Certified Associate Java SE 8 Programmer I exam (1Z1-808). With complete coverage of 100% of the exam objectives, this book provides everything you need to know to confidently take the exam. The release of Java 8 brought the language's biggest changes to date, and for the first time, candidates are required to learn functional programming to pass the exam. This study guide has you covered, with thorough functional programming explanation and information on all key topic areas Java programmers need to know. You'll cover Java inside and out, and learn how to apply it efficiently and effectively to create solutions applicable to real-world scenarios. It is worth mentioning, that book is not only a certification guide, but in my opinion also is a good technical reference book which you can keep close to your work desk and refer to it when needed. Right at the beginning authors make a clear point, the book's content they try to keep harder than the actual exam is going to be. According to the book authors, exam is not an easy one, so it is rather a good idea in my opinion to improve significantly your knowledge portfolio and be well prepared after you finish study the book which keeps your head to spin a little bit harder than the actual exam may require. As you'd probably expect, at the beginning authors spend a bit of time giving you an idea how the exam is going to be organised, what kind and type of questions you could expect, and what strategy to use in one or another situation. As an example, I found an advice a priceless one, where one of the possible exam answers is "code doesn't compile". Authors advice you to debug code first and see if it indeed does compile, and only then consider any other answers as correct ones. So following that advice you can save a lot of the time. To my big surprise, at the beginning of the book I found an assessment test, which gave me a clear idea what was my current knowledge and what chapters requires my double attention just not to miss important details. As mentioned at the beginning, I consider this book as a good technical reference book too, it is because authors quite often go beyond necessary exam topics details and explains concepts at a more advanced level, so you could expect to learn a lot more things you may did not know before. Reading authors biographies at the beginning of the book you can see that authors have an extensive experience as a developers in industry, so good amount of industry strength advices you could find across reading the book. What is down to the actual exam topics material, I believe it is very good. Concepts explained well and in details, this is basically what you expect from a good certification guide. At the end of each chapter you can find an exam type questions covering the chapter you just read. This obviously gives you a good warm up and some actual experience on the futures exam you'll be going to take. As a book owner you'll also get an access to an electronic online learning environment and the test bank which includes sample tests, electronic flashcards, in short - all the help you need to be ready on the exam day. The book begins with a thank note and brief history about Sybex publication’s journey of more than 30 years, ensuring how committed they are to produce the best books. The publisher and authors of this book are interested to hear reader’s comments and get their feedback just to know how they’re doing, for this they have provided their email as well as forums where you can reach them very easily if you have any query. Getting an answer from the authors of book itself, what someone would expect more than that? So the authors appeal everyone try the code, if have any problem post what you tried and what error says. On the very next page you would get to know about the education, technical experience and other contributions of the authors, reminds you publisher’s promise being kept. Since there are different versions of Java, Java certifications with different names, for beginners it’s quite baffling which exam they’re supposed to take all such doubts are very well cleared by the authors in the introduction part with some valuable advices. As authors say this book incorporates questions harder than those on the real exam and yes it does, the notion behind this is to give you more practice so you can answer more easily on the real exam. If you have basic knowledge of Java and want to strengthen it or prepare for the certification exam then this books is worth stacking on your shelf. It is always good to keep track of your progress which this book does by having assessment test at the beginning before you start reading the actual content so you come to know you current level of knowledge plus which concept you are weak in so you can emphasize more on those concepts. In the introductory part of the book you get the precise information regarding the exam as well as answers of all how-tos right from using this book to scheduling the exam and finding your exam score. Book explains how chapters in this book are organised, also at the beginning of each chapter it list outs the OCA exam objectives covered in that chapter makes clear what you are going to learn. You’ll also see how code formatting on the exam will be, with appropriate examples so reducing chances of losing marks merely because of wrong assumption of code. While reading the book in every chapter you will encounter note which gives short but fruitful information you need to pay attention to for the exam. For an example a note in chapter 2 on page 58 briefs in Java 1 and true are not related in any way, just as 0 and false are not related, where newbies generally fumbles because of other languages where 1 means true and 0 means false. You also get the real world scenario examples in real word scenario section and the sidebar consisting longer notes. At the end of every chapter you get the summary and exam essentials, I find it is really helpful to get a brief notion what you have been learned in this chapter, key points to emphasize on. If you’ve already read the chapter and don’t have much time to go through whole chapter you can just go through this to revise. Once you perused the chapter get ready to test your understanding of the concepts covered in that chapter by answering the review questions. Authors advise you if you can’t get a specific score you better review the chapter or at least those section you found difficult to answer the questions about. With the book you get free online learning environment which encompasses sample tests which gives you real exam experience, electronic flash cards for last minute test preparation before the actual exam and glossary with key terms from the book. All these online materials are plus point when preparing specially for the certification exam. I'm really impressed by the efforts taken by the authors to make this book available for exam aspirants, considering this was their first attempt to publish a book about OCAJP 8 certification. Kudos to authors.